Rather than replacing an outdated or dingy tile floor you may be considering trying to paint it. This is a guide about painting a tile floor. In three adjoining rooms there is different pattern Italian-style ceramic tile. Can floor tile be painted to match that will hold up to traffic and cleaning? It is not wise to paint tile ever because most likely you will have paint chipping and possible falls. I used to lay tile for a living and we even recommend not sealing your grout because it is very difficult to change the color. Best bet would be to have it all torn up and replaced with tile that you are happy with. I just purchased an older home. 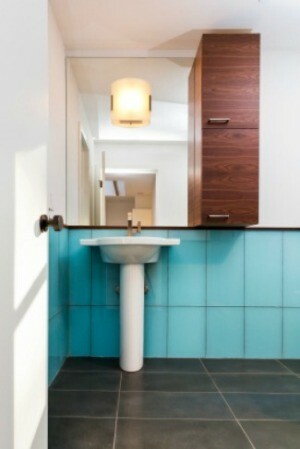 The master bathroom has some really ugly, drab blue tile on the floor. Is it possible to paint the tile and if so, what is the success rate of the paint staying and not chipping or peeling? Is there a lot of preparation work that would need to be completed prior to painting it? My late mother used to paint our old worn out linoleum in the living room, dining room, and kitchen. There were a lot of times that we couldn't afford to buy new linoleum, so she made sure the floors were scrubbed, then she got down on her hands and knees with the paint and a paint brush, she used grey as a base color (I don't know if she gave it more than one coat), then when that was dry she used odds and ends of other colors and a sponge and sponged spots all over, that were about the size of a coffee cup. The paint seemed to last quite awhile. I know what she used was oil based, and I think the grey might have been tractor paint, because the two tractors that we had were the old Ford tractors that started out as all grey and then eventually ended up part red in the newer models. Have you checked to see how much it would cost to use those peel and stick tiles that you can buy now? I wouldn't think it would be that expensive for a bathroom, unless it is a huge one. When my mother was painting the floors they did get a lot of wear because there was four of us kids, and as we became teenagers, sometimes there was dancing in the living room.